After our hike the day before we felt that we should keep up the hiking while the weather was good. 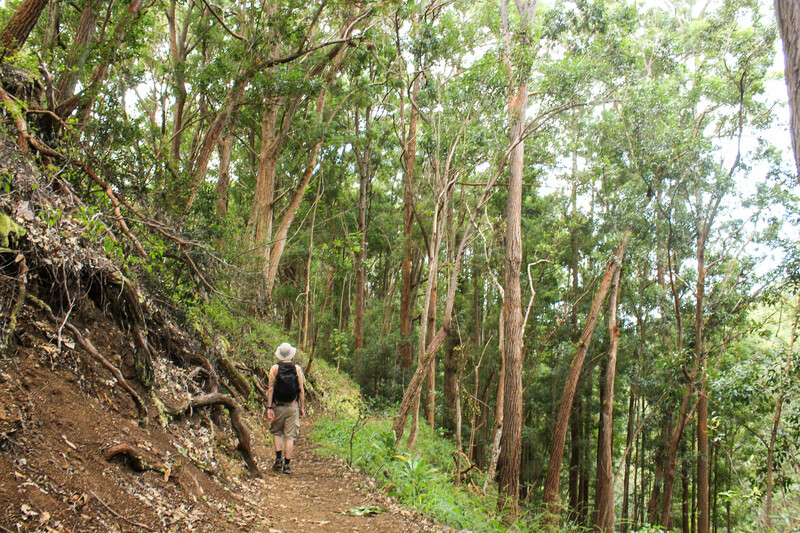 We figured that while we were living around Pearl Harbor we would take advantage of the centrality of our location and get some hiking done in all the regions of the island. For reference in future posts, the island of Oahu is divided by two mountain ranges running North to South. The ranges are actually the remains of two extinct shield volcanoes that have eroded over the millennia. The Western (or Leeward) range is the Wai’anae and the Eastern (or Windward) range the Ko’olau. The two ranges are largely continuous with separate ridges leading up to the ‘Summit’. In addition to these mountains there are also multiple smaller volcanoes/craters (thought to be vents from the two major ones). We decided on this Sunday to hike the Aiea Loop trail on one of those ridges leading up to the Ko’olaus; first because it looked to be a step above Pu’u Ma’eli’eli and Makap’u, and second because there were letterboxes. 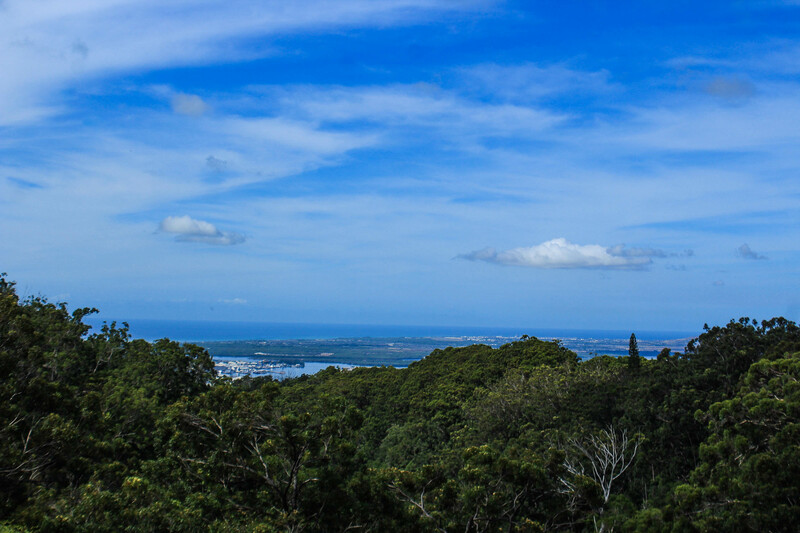 We drove through the town of Aiea and made our way up the ridge past all the built up neighborhoods, which slowly gave way to forest as we entered into the State Recreation Area. The trail was a loop so we decided to park at the lower trailhead and road walked up to the other. The trail started out passing though the tall Cook Pines before giving way to a grove of guava. We quickly found the letterboxes and then continued along. 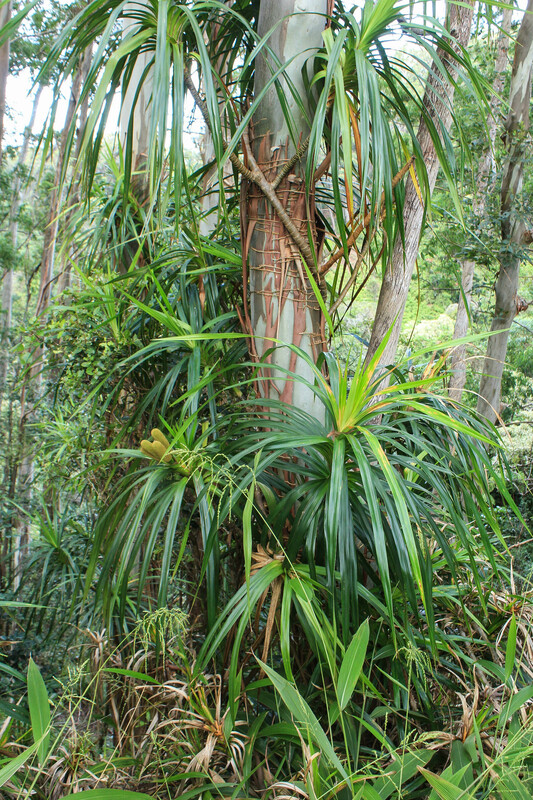 This was an interesting trail to try and learn the flora of the island. We passed through tall stands of Eucalyptus with fun cork-like bark, and groves of the tall canopied Rain Tree or Monkey Pod. The forest floor was filled with ferns and broad leafed Elephant Ear while Ie’ie vines climbed up the trunks of the tall trees. Up to this point, the trail itself offered very limited views to the North and neighboring ridges. 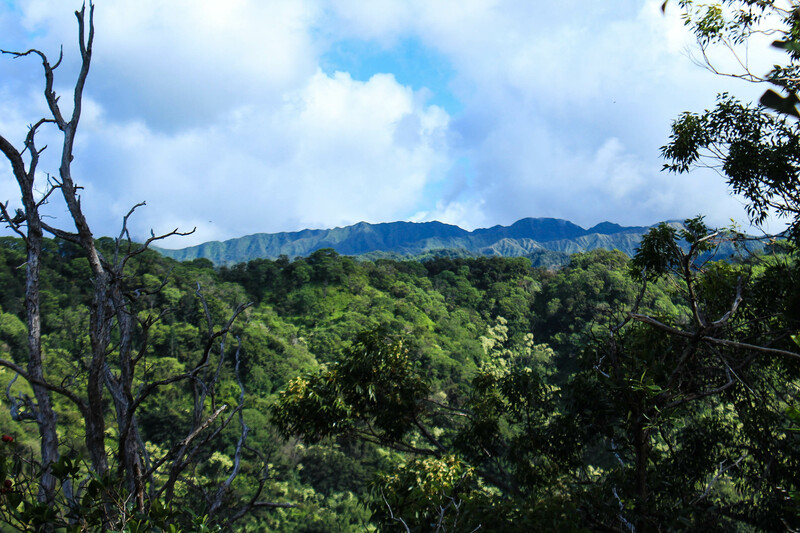 But when we reached the far end of the loop, the trees opened up and allowed us to look up the ridge toward the Ko’olau summit and down into the valley at the H-3 (an interstate) as it wound its way through the mountains. We spent a while here admiring the views and speculating how the Aiea Ridge trail, which branched off at this point, made its way up to the top of the Ko’olaus. As we were about to leave, I noticed a tree along the Ridge Trail which had visible yellow fruit. Not wanting to miss out on a chance to learn about a potentially edible food (I’m all about that foraging), I asked a nearby couple if they knew what it was. When they replied Guava, I immediately took one off the tree and tried it. Probably not the best idea to take foraging advice from strangers, but it matched with what I guessed, and tasted delicious. 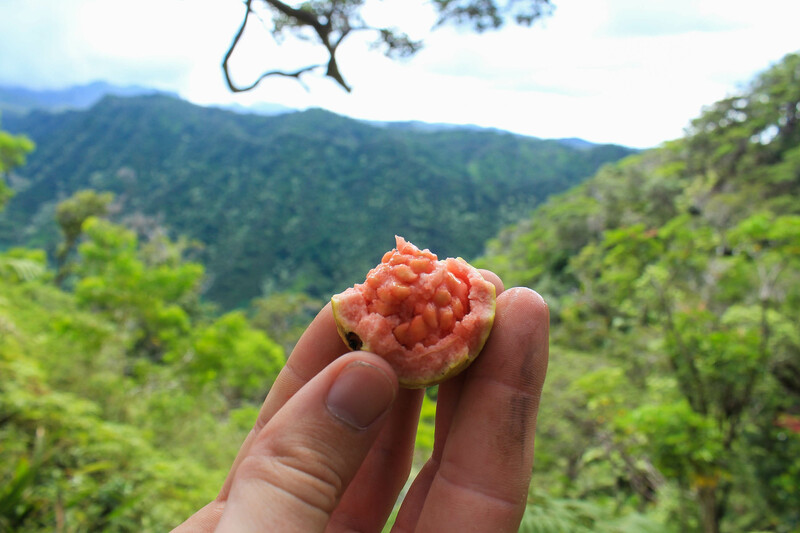 These guava (known as Brazilian or Common Guava) are yellow with a pink center and are bigger and slightly sweeter than their more invasive and prevalent sibling, the Strawberry Guava. We continued along the loop passing by more lookouts down into the valley and through the forest. Towards the end, as we neared the car, the trail got muddier as it switchbacked down and back up. It was very humid and muggy around this part, so once we made it back up out of the valley, we stopped for a break to cool off before making our way back to the parking lot. Whenever we go hiking, we are always thinking about whether each hike would be good to bring family or friends when they come to visit. So far, both easy hikes we had done were a definite yes. This one we thought would be enjoyable if anyone wants to learn about the plants that grow on an easy, enjoyable hike, though depending on the weather and trail conditions, we may suggest just doing the first half of the trail to the H-3 lookout, then returning the same way rather than hiking through the thick and muggy section down into the valley. The entire loop hike was under 5 miles, if you’re interested you can check out our Alltrails trip report here. We went around the loop clockwise and I personally think that’s the better (and easier) way to do it.